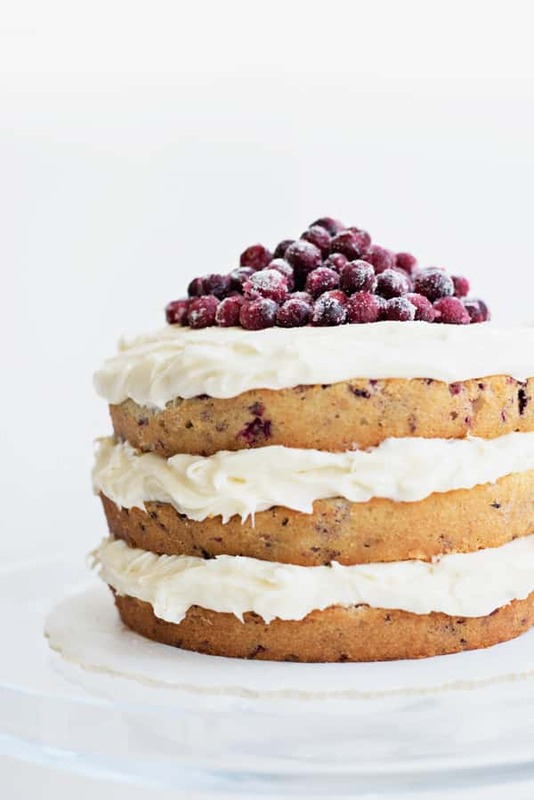 Amazing rustic layered cranberry orange holiday cake recipe – perfect for a Christmas wedding or a holiday party. It’s easier to make than it looks! I think this cake is one of the prettiest things I’ve ever created. I originally shared the recipe on the Mark & Graham blog (one of my favorite places for personalized holiday and wedding gifts), but I wanted to share it with all of you here this year! 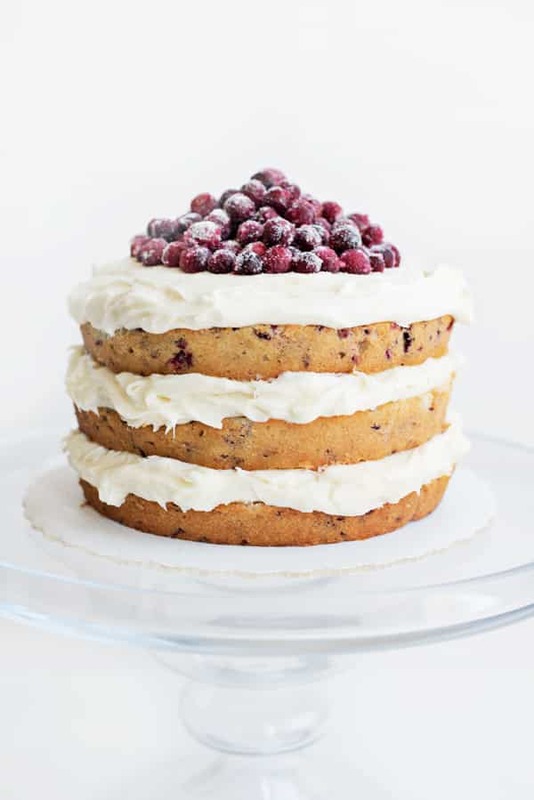 Traditional holiday cranberry bread gets an upgrade as a fluffy layer cake and this ‘naked’ cake style is doable no matter what your baking skill level. No fancy icing tricks, all you do is slap a layer of frosting on each cake layer and you’re done! No crumb coats, no piping… The rustic result is all part of its charm. 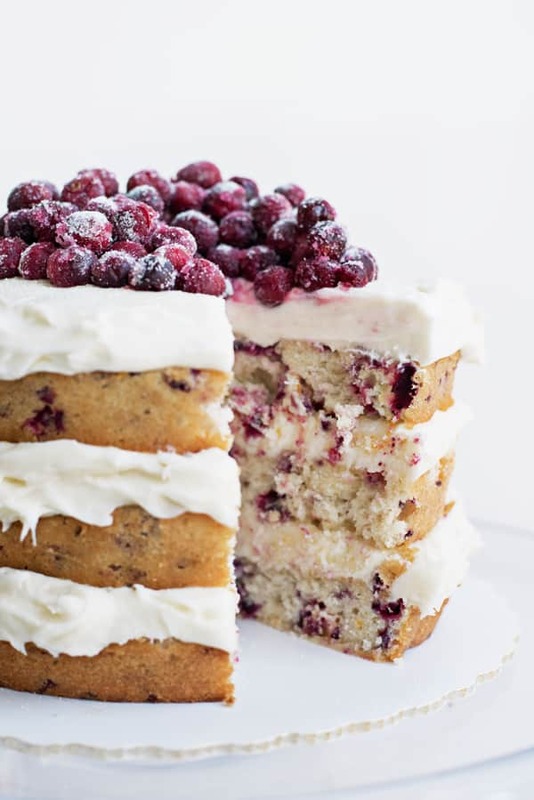 Topping the cake with sugared cranberries is also super easy and absolutely stunning. This cake would make a fabulous Christmas wedding cake, or a stunning end to a holiday dinner party. I’m definitely going to make it again this year, and turn it into a holiday tradition! If you’re making it in advance, just make sure you keep extra sugar on hand to refresh the sugared cranberries before serving. They tend to soak up the sugar as the cake sits. Mark & Graham makes this gorgeous glass cake stand, which sadly isn’t available this year, but there is a smaller version that is equally lovely. They also offer free monogramming if you’re looking for a really special wedding present. Amazing rustic layered cranberry orange holiday cake recipe – perfect for a Christmas wedding or a holiday party. It’s doable no matter your skill level. Originally published on the Mark & Graham Blog. Prepare three 8-inch cake pans by spraying with non-stick cooking spray and lining the bottom with parchment paper. Preheat oven to 350 degrees F.
In the bowl of a stand mixer (or with a hand mixer), beat the butter until soft and pale yellow, about 1-2 minutes. Add the sugar and beat on medium until light and fluffy, about 3-5 minutes. Add the eggs, one at a time, scraping down the sides and beating well after each addition. Beat in the vanilla extract. With the mixer on low, add the flour and milk in alternating additions, finishing with the flour. Do not overbeat. Coarsely chop the cranberries or pulse a few times in a food processor. Stir into the cake batter along with the orange zest. Divide batter into prepared cake pans and shake slightly to level. Place on middle oven rack and bake for 25 to 30 minutes or until a toothpick inserted in the center comes out clean. Let cool in cake pan for five minutes then remove from pan and transfer to wire rack. Remove parchment paper round and let cool completely. Combine the cream cheese and butter in a large bowl and beat on medium until smooth. Add the vanilla extract, brown sugar, and Grand Marnier. Beat on medium until combined. Add the powdered sugar in several additions and mix on low until incorporated. Combine 1/2 cup sugar and 1/2 cup water in a medium saucepan over medium heat. Stir until sugar is dissolved, 2 to 3 minutes. Stir in cranberries and heat for 3 minutes. Using a slotted spoon, transfer to wire cooling rack. Let dry for at least one hour. Roll cranberries, a few at a time, in remaining 1 1/2 cups sugar until coated. Let dry for at least one hour, or overnight. 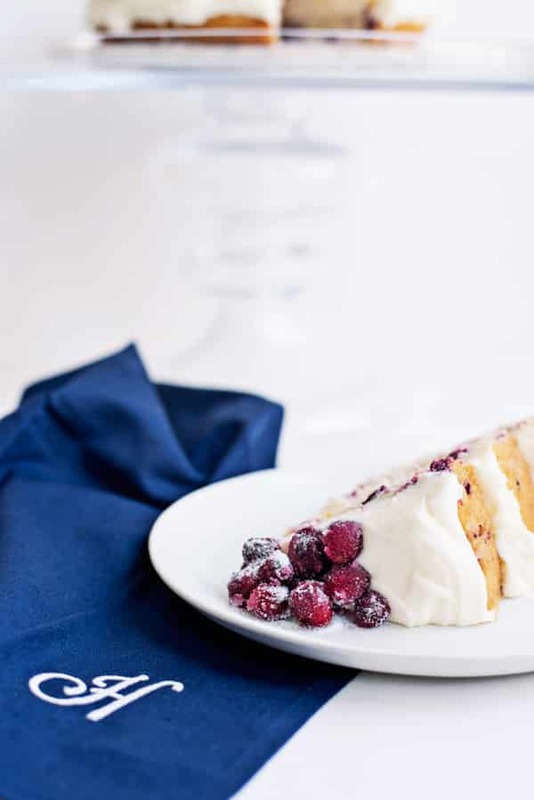 Place a cake layer on a platter that fits in the refrigerator. 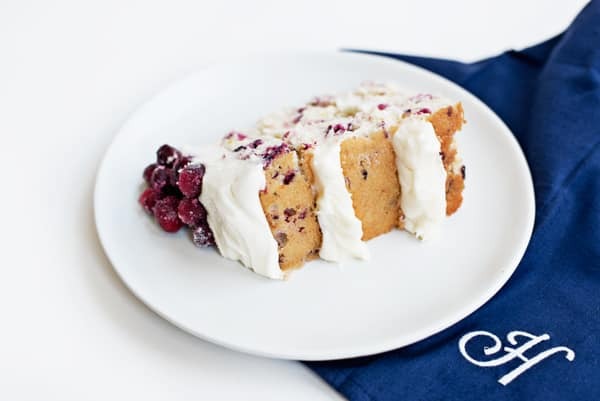 Cover with one-third of the cream cheese frosting and use an offset spatula or knife to level. Chill for 10 minutes. Repeat, alternating cake and frosting, finishing with the final third of the frosting. Top with sugared cranberries. Dust with an additional layer of granulated sugar immediately before serving. If making in advance, sprinkle cranberries with additional sugar immediately before serving. Thanks so much! I’m debating making it instead of pies this holiday season! This looks amazing!!! Both delicious and stunning. 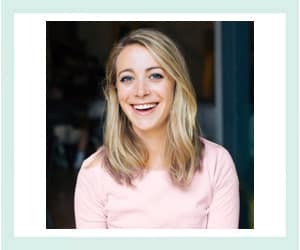 Thanks so much Katie! I wish you could have tried it! This looks amazing! And looks perfect for the holidays! Holy oh my gosh! I totally have to make this for Christmas this year! I’m going to need to throw it onto my Pinterest board for my Christmas Cakes Roundup! Awesome! Thanks so much for sharing it Melissa!